The King’s Quest 2015: Chapter 2 walkthrough will guide you through the beginning to ending moments of gameplay with puzzle solutions and strategy tips for this episodic adventure game on the PC, PS3, PS4, Xbox 360 & Xbox One. 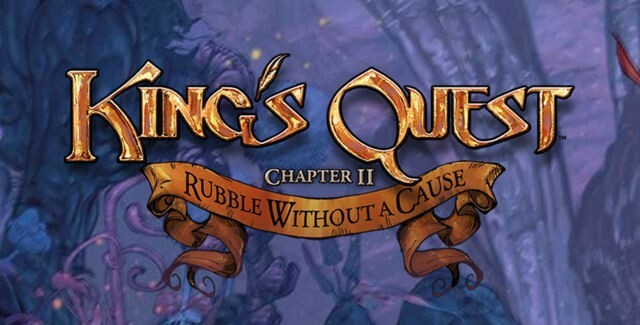 Let’s start the “King’s Quest 2015 – Chapter 2: Rubble Without a Cause” walkthrough with an intro video followed by a full perfect playthrough! King’s Quest is a five-chapter story arc. As an aging King Graham reflects on a life of heroism with his granddaughter, Gwendolyn, players are transported back to experience firsthand the untold tales that shaped a kingdom. Please note that viewers must be at least age 10-12 to watch, in America & Europe respectively, so no harm comes to those with innocent eyes. This game includes Fantasy Violence. King’s Quest is a collection of five different chapter releases, each focusing on an untold tale in Graham’s past. In each chapter, an aging King Graham reflects on his life of adventure with his granddaughter, Gwendolyn. Developed by The Odd Gentlemen, King’s Quest rekindles the classic feelings of exploration, wit and wonder that have always defined this family-friendly series since its introduction over 30 years ago. – The second entry in a planned five-chapter arc, King’s Quest: A Knight to Remember continues the unforgettable journey to come with original places, puzzles and personalities to discover. King’s Quest brings adventure gaming into a new era while staying true to what made the original games beloved; the unforgettable storytelling, wit, puzzles, and of course plenty of ways to die! Select between the noble pillars of Bravery, Wisdom, and Compassion to see what rippling effects these choices will have on Graham’s journey as well as later chapters. Puzzles will offer multiple solutions, encouraging players to experiment with their inventory and environment. Befriend the most unexpected and peculiar of companions throughout Daventry! Chapters Download Note: If you bought the “King’s Quest: The Complete Collection” or “Season Pass”, DO NOT repurchase this new chapter or you will be charged again. “King’s Quest – Chapter 1: A Knight to Remember” is required to play this content & is sold separately. Future chapters can be downloaded from in-game upon individual release throughout 2015 and 2016. How To Save Every Human Prisoner: If you don’t want to lose any townsfolk in Chapter 2; Follow this next (separate) step-by-step visual guide to find out how to save everyone (except for Mr. Fancycakes) within 50 minutes! How To Save Mr. Fancycakes: Simply give the Cure-All medicine potion — that you can buy for 1 gold coin from the Merchant of Miracles elderly salesperson — to the Mr. Fancycakes “unicorn” pet near your own cell, instead of giving it to the sick & pregnant Bramble. Then after it breaks out of its cell, return Mr. Fancycakes to its owner the Merchant of Miracles. Welcome to the King’s Quest 2015: Chapter 2 walkthrough! Story Synopsis: King’s Quest – Rubble Without A Cause is the second of five chapters in the new, critically acclaimed reimagining of the classic King’s Quest game series. In this latest adventure, King Graham takes players back to his first test as ruler of Daventry. When a mischievous horde of Goblins takes his kingdom hostage, a newly crowned & woefully unprepared Graham must rise up to free his people & prove himself the leader he was destined to become. The new king meets with Olfie after getting bored by his King’s duties, then later suddenly gets kidnapped by Goblins and forced to finish all their daily chores. Hint: The game is all about using the environment to tell the story. Use time in different ways, and paying attention by examining all aspects; For example by observing the environment. One of the tenants of the old games was to always be able to use exploration and curiosity. So you can go out and find that story for yourself. Find Medicine for Bramble who is sick, found the missing ingredient eyes of flies. This guide further explains how to catch Flies, how to get the Free the Frog puzzle solved, and how to find the Goblin its prince. Tip: You need to be careful when you eat the meat, and make sure you don’t let anyone starve or you may miss some Quest.? – So preferably don’t eat the meat yourself at all, so everyone else gets their fill and survives. Find flour to make Sweetycakes, Find wood for furnace. Location of Chunder Blossom, find Gold Coins. Buy the Last Bowl of porridge with Branberries. Notably, the video guide shows the location of the Small Key for the Locked door. And where to find a Long Handle for a Blade. Hint: If you let the girl in that room starve you get the 2nd Gold Coin the little goblin plays with (not the one from the tower) and a Key. Graham must find these ingredients: Wilted Rose and Pea. Next, find the Song for the Music Box Puzzle. He figures out how to prepare the Chumber Blossom. And Muriel brews up a Bone Bomb. the Stone Pillars. Finally, seek an audience with the Goblin King. See The EPIC conclusion to “Chapter 2: Rubble Without a Cause” of King’s Quest. Coins & Pages Tip: Do you want to find all the gold coins and pages in Chapter 2? Check out our full guides for both collectable types listed at the top of this page! To Be Continued: Chapter 3 will arrive later on, in 2016. – Get a preview of it and join the discussion in our “King’s Quest 2015: Chapter 3 Release Date“. Thanks to Sierra, GamerrZombie, UKGamingNetwork & Saskia for the walkthrough videos. Do you need help anywhere? Please don’t hesitate to ask in the comments section below. We’re here to help out!